The producer of Arms, Kosuke Yabuki, was one of, if not THE, best dressed of the evening. The cut of his shirt and jeans are flattering and +1 for the shoes. Hisashi Nogami, producer of Splatoon 2, appears to be quite a character, and he wore the outfit to match at the Nintendo Switch event, donning a white scientist coat, graphic tee, and sweet red sneakers. Along with the sunglasses, this is a great ensemble. Legend of Zelda producer Eiji Aonuma's glasses, hair, goatee, and hoodie stole the show in my opinion. Suda51 looked pretty laidback, if not typical for a game dev. Not shown are the white high top sneakers, which added a lot to the outfit. Nintendo Switch General Producer Yoshiaki Koizumi was the diva/star of the show, with at least three different looks throughout the event. This three piece black ensemble, from a pre-recorded clip, is probably the most stylish. Ever hear the saying, wear the clothes, don't let the clothes wear you? The suit may be simple, but it's well cut, and Yoshiaki Koizumi sells it with pure attitude. Yoshiaki Koizumi also got to wear an outfit in homage to the upcoming Super Mario Odyssey, a garish but plucky affair. Highlight: the hat. Shinya Takahashi is one of the most important developers at Nintendo, and his choice in ensemble for the event was almost perfect. The leather shoes and dark cuffed jeans really make the look, but unfortunately it's ruined by the fit of the pants, especially around the inseam, and how high the belt sits. Close but no cigar. Corporate director of SEGA Games, Toshihiro Nagoshi also apparently doubles as one half of The Eurythmics in his spare time. I'm not exactly sure what is going on here with Nintendo Switch General Director and 1-2-Switch producer Kouichi Kawamoto. The ill fit of the suit, the highwater pants, the bulk of the sweater underneath the jacket, the tuck. Probably the worst outfit of the night. Good hair though. Todd Howard from Bethesda was busy doin' his Todd Howard thing, in an unimaginative but flattering sky blue vneck. Executive Vice President of EA Worldwide Studios Patrick Soderlund slightly redeemed an immensely boring suit, dress shirt, and pocket square combo with a well chosen pair of leather shoes. 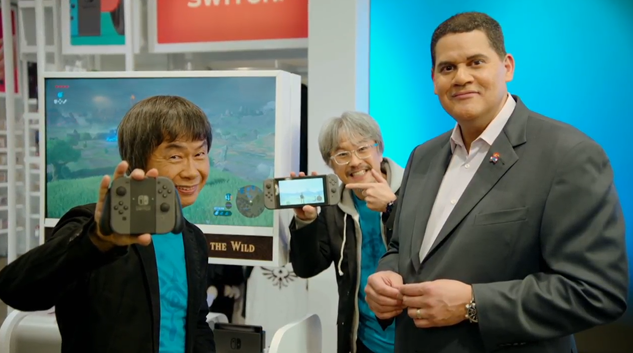 President of Nintendo of Europe Satoru Shibata switched it up a bit with a dark polo and jacket combination, a professional look erring on the side of casual. As the highest ranking member of the company, Nintendo president Tatsumi Kimishima is entirely entitled to dull business suits. The slight contrast of his lightly textured blue tie and navy jacket were tasteful, even if immensely boring. The Nintendo Switch livestream event held by Nintendo on Thursday night was an amazing showcase of what the company has in store for us upon the console’s official debut on March 3, 2017. And sharing that with us were a number of key figures within Nintendo who rolled out in their finest garb to look their best as the next phase of careers begin. From Suda51 to the revered president of Nintendo himself, here are the fashions of the night and the impressions they left on us. Holly Green is a reporter, editor, and semiprofessional photographer living in Seattle, WA. She is also the author of Fry Scores: An Unofficial Guide To Video Game Grub. You can find her work at Gamasutra, Polygon, Unwinnable, and other videogame news publications.